Almost two years ago we had our Wedding Ceremony and reception in Miami, that same year we moved to Germany, a few months before our wedding. It was a crazy year for us, so many wonderful things were happening, but because we had so much of going on, we couldn't take our honeymoon right after our wedding. We also wanted to recuperate financially from everything we had to do in one year, it was not easy on our wallet. Fast track to a few months after and we were on our way to our honeymoon. I was very excited because we were going to drive all the way to Venice, Italy, where our cruise ship was porting out of. That meant that we would have some of the most beautiful scenery on our way there. For me, there is nothing so calming and relaxing then taking a road trip. I didn't capture nearly as much as I would have wanted to during our way there, but these are some of the wonderful things we got to see with our little eyes. The day started off fogy as you can see from picture one, but as the day progressed, the sun started to beam and the air was nice and crisp. Most of what we encountered was magical castles, like the ones you dream about as a child, lushes fields of greens, apple orchids, and grandiose mountains that make you feel like you are just a small part of this beautiful universe. Upon arriving to Venice, we checked in for the day at Hotel Venice Resort, a small but adorable hotel off of the main island, just because getting to the port is easier from mainland and trying to get to the island with a car is not easy, plus most of the hotels in the island don't even have any form of parking. So if you ever drive to Venice, keep that in mind, it is better to stay mainland, you can either take a bus or taxi to the port area where you will need to catch a water taxi. We only needed one night, as the next day we were embarking. 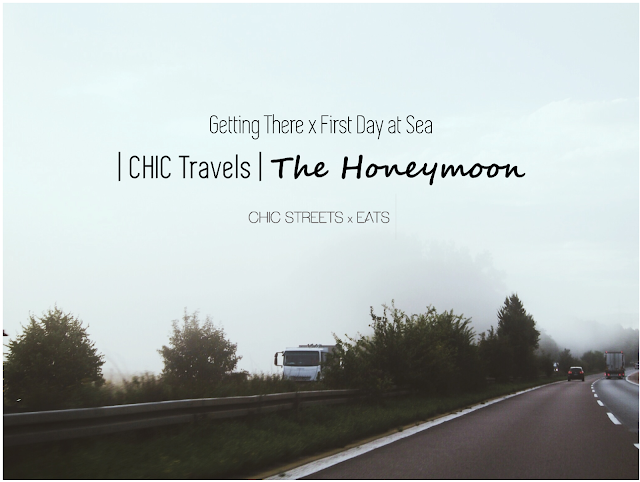 We decided to do a cruise for our honeymoon, it was mostly my husband's idea as I am not a total fan of cruises, but for him is more for the peace of mind of not having to be driving anywhere, not getting lost, or dealing with GPS issues. Since this was for the both of us and not just for my own pleasure, I gave in to the idea. I wanted him to be stress-free, he works so hard all the time, that his mind is always on the move. Upon embarking on our Royal Caribbean cruise ship, we set out to the outdoor space to check out the most amazing views of one of my most beautiful cities I've ever seen...Venice. Aren't these snaps of Venice, so stunning? my imagination of what the city was like ran wild that day as I laid eyes on it from afar. After all the commotion of check-in and doing a tour of our ship, we settled nicely into our suite. The #bae immediately went for the balcony and enjoyed a magical Mediterranean sunset, as did I. Just look at those colors of this sunset, it's like a painting. This was the next morning, as we rose, we had this view. We were on our way to Croatia. Croatia from afar, like a dream, that is all I kept thinking. The water was as blue as the sky and those houses nestled on the cliffs were something I thought I would never see, but here it was, in front of my eyes and I couldn't feel more happy. The fun will continue as I bring you to our first stop, Croatia in my next post this week. In the meantime, check out my Instagram for some #tbt pictures of the #CSxEHoneymoon.